Chanel fragrance and perfume list. Founded by the French couturier Gabrielle "Coco" Chanel in 1909, the House of Chanel has become one of the most respected fashion empires in the world. The collection today includes haute couture, ready-to-wear, handbags, perfumes, and cosmetics and skin treatments. The legend and allure of the interlocking-C logo endures beautifully. 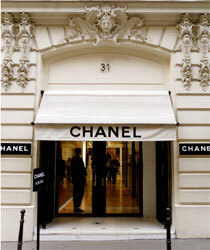 Chanel (pictured above) opened her first fashion boutique in 1910 at 31 Rue Cambon, in Paris, France (pictured right). Originally selling mainly hats, before moving into couture designs.